What’s your reach on YouTube? In YouTube Studio Beta, Analytics now has new metrics to help you better understand your reach on YouTube. This funnel shaped card (example below), in the REACH VIEWERS tab, shows you how well you’re appealing to potential audiences (Impressions), capturing your audience’s attention (Views), and keeping them watching (Watch time). Depending on where your viewers find your video, you can see data at the channel or video level for each step to better understand how viewers are choosing to watch your videos. Note that the impressions number does not include instances where your content is found through “external sources”, like embeds on websites, blogs, social media, or YouTube notifications. Once your video is published, YouTube starts surfacing it to relevant audiences, based on their behavior on YouTube (like what they watch, don’t watch, what they search for, etc.). When a viewer comes across your video thumbnails on YouTube, it’s called impressions, that is, how many times your video thumbnails are shown on YouTube. Think of each impression as potential reach on YouTube and an opportunity to earn a view. Impression data is available at both the channel and video level so you can look at an overview on your channel or deep dive into how individual videos are doing. Note: the impressions number does not include instances where your content is found through “external sources”, like embeds on websites, blogs, social media, or YouTube notifications. Impressions and click-through rate is available from January 1, 2018. Learn more. Some of you might also see the bar below the impressions number. This bar shows where your videos are showing up on YouTube. The orange part shows the percentage of impressions specifically from YouTube’s home page, from recommended videos in Up next on the watch page, or from the Trending tab. The grey part comes from other places on YouTube like search and subs feeds. If you don’t see this bar, don’t worry, not all channels may see it. Learn more. What counts as an impression today? The thumbnail has to be shown for more than 1 second and at least 50% has to be visible to viewers, see image below. An impression is counted right away if a viewer clicks on the thumbnail. Clicking on a link does not count as an impression. Notifications and traffic from external websites or end screens are not included in your impression number. When and where your video surfaces can influence the number of impressions. Let’s look at the example below to see how the number of impressions changes over time and why that might be so. Spikes in impressions can be common soon after upload. You may see this because your subscribers and returning viewers are likely to be the initial audience of the new upload, kickstarting its performance on the platform. It’s common for impressions to decline after the initial spike as the number reaches a steady state. YouTube is continuing to surface your videos in different places such as Search and Suggested Videos to wider audiences over time. Check your Traffic sources report to see where viewers are finding your content and change the date range to see how this changes over time. Additional bumps in impressions can occur. You may also see another bump in impressions at your next video release or when there is a renewed interest from viewers, like a yearly uplift in topical videos (e.g. holidays), a boost if the new content is closely related, or if your video is picked up by a popular website driving additional watch time. Check out the lesson for more tips on how discovery works on YouTube. Think about what made your best performing videos successful. Try asking yourself, is there a specific topic or format that is more successful or one that has exceptionally high or low impressions? Has this changed over time? How broadly appealing are your videos - is this niche content or videos that a wider audience could enjoy? You can think about where your thumbnails are showing up and how you can best optimize them. Ask yourself, are they showing up mostly on the home page where they need to stand out from the other content? Or if impressions are coming from search results, what can make them stand out from similar content? For example, if your content is getting clicks on “Up Next”, you can consider adding your content to playlists, have end screens to point to more of your related content, or check on the consistency of your titles and thumbnails. Note that impressions from end screens are currently not counted. Learn more about discovery on YouTube. 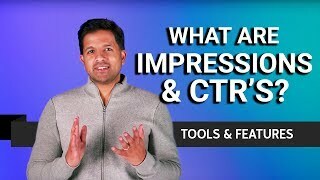 If you see more views than impressions or your impressions seem low, it could be that most of your viewers watch your video outside of youtube.com or viewed in a background tab. We’re not currently logging impressions from these sources. When comparing videos, you will want to compare the same time frame of a video’s life, like the first 7 days. Learn more about the different traffic sources on YouTube. Learn more on where impressions are counted. Impressions click-through rate shows you what percentage of your impressions on YouTube turned into views. This measures how often viewers watched a video after seeing an impression. Keep in mind, while some of your views come from impressions, some views might come from sources with no thumbnail impression, such as views from links shared outside of YouTube. As your videos become more popular, they may get shown to a wider audience, and you may get more impressions. Since this audience may extend beyond your core viewers, your click-through rates may be lower, but don’t worry, you may still see an increase in overall views and watch time. High CTR isn’t always a strong indicator of success. Be sure to look holistically at the content and conditions around that video. Look at Average view duration, Average percentage viewed to get a fuller picture of how well the video appeals to your audience. CTRs may differ depending on when you look at your video and how you compare it with average percentage viewed or with traffic sources. CTR is often highest right after upload when some of your most passionate fans and subs might see the video at the top of their home page and subs feeds. As total impressions grow beyond your core audience, CTRs are expected to decline until reaching a relatively stable percentage (this is totally normal). You can also look at the ratios between impressions click-through rate and average percentage viewed for various videos or series to see which is working better for you. Video A shows a higher CTR than video B, but much lower average percentage viewed than Video B. If you look at the title, My awesome YouTube movie 2017, it’s less specific than the title of Video B, so it could be that the video might not have been what the viewer expected after clicking into the video. Video B has lower click-through rate but higher average percentage viewed. It could be that the subject and title of the video, has a specific, appeal to narrower audiences but overall the content delivers on its promise once found by these niche viewers, as indicated by the high average percentage viewed. How can you analyze your data? Impressions click-through rate can help you see how effective your thumbnails and titles are. Based on the different click-through rates and traffic sources, ask yourself: Are viewers choosing to watch your videos? Do your thumbnails accurately showcase what’s in the video? Look at CTR + watch time to help you understand how compelling viewers find your video based on your thumbnails and titles. Look at CTR + average view duration and average percentage viewed to give you an idea of how much users are watching through your content. You can sort by CTR to see what’s the top traffic source. Look at traffic sources to help you fully understand where views and watch time are coming from. Traffic sources like "YouTube Search" and "Browse" features typically have higher CTR because viewers are already looking for specific content and have a higher intent to watch if they find what they’re looking for. Note: Some views, such as those from external websites, apps or notifications, are not included in this calculation, because they don’t originate from an impression on YouTube. As the number of impressions increases, you may see lower CTRs because the audience it is shown to is likely to be less targeted. This is normal. Try sorting videos with high (or low) CTRs to see if there is a common pattern, like from traffic sources. Suggested may have most impressions and Watch Time because your viewer is already watching this type of content and may be interested in more. Home or Suggested can have lower average percentage viewed because a broader, less targeted audience is deciding whether to watch your video just based on its thumbnail. Learn more about how video views are counted. Converting potential viewers into actual viewers is only the first step to succeed on YouTube. The golden ticket is to make sure your viewers want to watch all the way through your videos, as measured by average view duration and watch time. Think about how your audience can engage more frequently with your content, which can help increase promotion and exposure on YouTube. This in turn can lead to more impressions and a potential for new viewers. Learn more about the watch time report. Note that these suggestions are based on our experience with YouTube creators and are intended only to provide tips and guidelines. They are not guarantees for success; every channel will have different results. Unique viewers, found in the REACH VIEWERS AND AUDIENCE tabs, is a new metric to help you understand how big and active your audience is. This metric shows the estimated number of different people who come to watch your videos over a set time period. Whether someone watches on desktop, on their mobile phone -- or watches more than once, that person will count as one unique viewer. This information can help guide what video to make next, and, it can also be helpful to show brands when negotiating brand integration or sponsorship deals. You can find out how much content an average viewer watches on your channel during the selected time period. You can also compare the size of your audience to the number of subs and see which video or group of videos helped tap into a wider audience. At the video level, you can look at views per unique viewers (currently not available as a report) to find out if viewers watch your video more than once. Why are my Unique viewers lower than my subscriber count? If your unique viewers is lower than your subscriber count, it may be that your subscribers are not always active with your channel at a given time. Consider asking them to ring the bell so they get notified of every new upload on your channel. It could also mean you are looking at a short date range which includes few new videos being published on your channel. Try expanding the time range - new uploads provide incentives for viewers to come back to your content so you may see your number of Estimated Unique Viewers go up. Finally, you might consider strategies that will help you break beyond your existing audience, for instance collaborating with other creators, creating content around trends and seasonal events, boosting discovery by making the most of your thumbnails and titles and keeping your channel fresh with uploads and playlists. Look at your total uniques before you upload your next video and compare it to the number of uniques right after you uploaded this video to see if you’ve reached a new audience. Learn more about unique viewers.